By Cayla Solomon--After years of planning, the dream of a new, northern location of Bialik Hebrew Day School is about to become one step closer to fruition with the June 18th groundbreaking of its new location on the Joseph and Wolf Lebovic Jewish Community Campus. Bialik Hebrew Day School – the Ben and Edith Himel Education Centre on the Joseph and Wolf Lebovic Jewish Community Campus – will open its doors to children in Vaughan in September 2013, beginning with JK, SK and grade one. The opening of Bialik Hebrew Day School on this campus will provide Jewish children with access to Jewish education only steps away from their homes and other Jewish community facilities. “Our Board is thrilled to know that the Jewish community of York Region will have another option for Jewish education and that, in cooperation with UJA Federation, we have laid the cornerstone for Jewish continuity in the fastest growing Jewish community in the Diaspora,” said Bernie Gropper, President of the Bialik Hebrew Day School Board of Directors. Construction on Phase One of the new school will begin this summer. 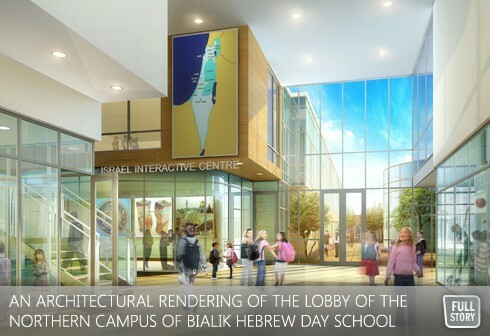 Ultimately, Bialik’s second home will be able to accommodate 800 students, and will include a unique Israel Interactive Centre, an auditorium/gymnasium, an art room, a fully-equipped resource centre and state-of-the-art technology. The groundbreaking will take place on Monday, June 18th, 2012 at 6:00pm. The ceremony and celebration, followed by refreshments, will be held at 180 Ilan Ramon Boulevard.